This is a sponsored post courtesy of Perfect World Entertainment. Previously on Star Trek Online: the Hur’q are invading. That’s bad news, but the Klingon speakers among you will already know that. Hur’q translates to ‘outsider’ and they’re leaning into that identity by becoming everyone’s enemy. It’s up to the Alliance to come up with a defence plan. And it’s up to you, in Star Trek Online’s new expansion Victory is Life, to bring the fight – either as a captain of the Federation, Klingon Empire, or Romulan Republic, or for the first time as a warrior of the lizard-faced Jem’Hadar. It’s not an entirely selfless act as you’ll get to hang out with the former crew of Deep Space Nine in the process. Just don’t ask for autographs. Star Trek Online is one of the best free PC games ever, by our estimation. As you may know, an expansion pack is a major event in Star Trek Online. Victory is Life is just the fourth in the game’s lifetime, and with the show back on the telly, this is the perfect time to start living through your own episodes of the beloved science fiction series. This year marks the 25th anniversary of Star Trek: Deep Space Nine. It’s a series that has lived long and prospered in the memory, thanks to the ways it stood out from The Next Generation and Voyager. The show was named for a space station, not a starship, starred Star Trek’s first black captain, and explored all sorts of juicy and complex themes on society and war. 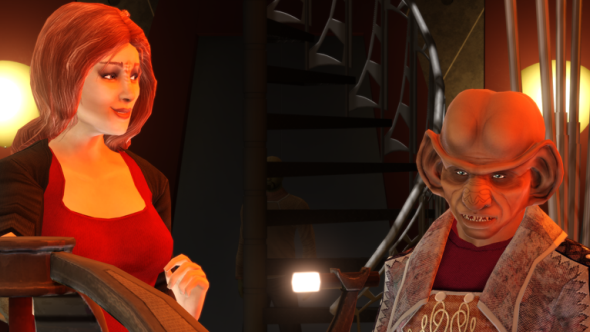 Victory is Life takes you onto the starbase itself, down the corridors where you’ll find members of the original crew like Quark (Armin Shimerman), Odo (René Auberjonois), Kira (Nana Visitor), and Doctor Bashir (Alexander Siddig). The Star Trek Online team has spent months recreating the space station, returning to the show’s set schematics so that it appears exactly as it did on TV. Only now it is you steering the camera. The Jem’Hadar are the genetically engineered soldiers of the Dominion. They’re designed for combat in all sorts of environments, and can grow into adulthood in a matter of days – starting out looking like human children, but soon sprouting the horns and scales that give them their distinctive look. Jem’Hadar grow fast in Star Trek Online, too, beginning the game with a properly geared and crewed ship at level 60, as well as a respectable pile of completed Reputations, Specialisation trees, and R&D progress under their belts. 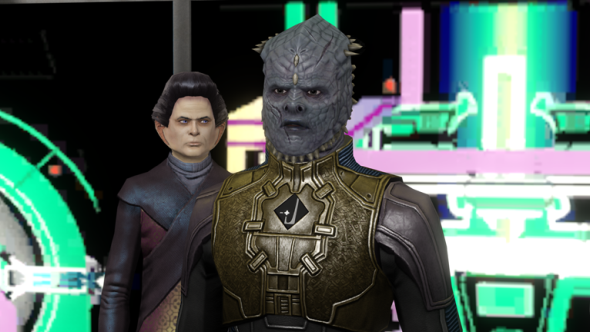 That makes a Jem’Hadar character the perfect way to see top-level content if you’re a new or lapsed player – Victory is Life bumps the game’s cap up to 65 for captains in every faction. The expansion brings an introductory episode for these spiky spacefarers, and one other very good reason to fly with the Jem’Hadar that can benefit all your captains: a new founder’s pack. That includes seven new ships, four of which are available exclusively for the new faction. Only by reaching Tier 6 Mastery in each Jem’Hadar ship will you be able to unlock them for every captain on your account. The Hur’q, eh – what are they like? First they stream out of the Gamma Quadrant, battling the Alliance in the anniversary episode ‘Scylla and Charybdis’. Then they unleash a devastating attack on Deep Space Nine, causing critical damage and upsetting ‘90s kids everywhere. It’s only fair that we should take the fight back to Gamma. Victory is Life introduces a new Battlezone – one of the Star Trek Online maps in which you fight the enemy for area control, fulfilling specific tasks against the clock and eventually defeating a boss mob. 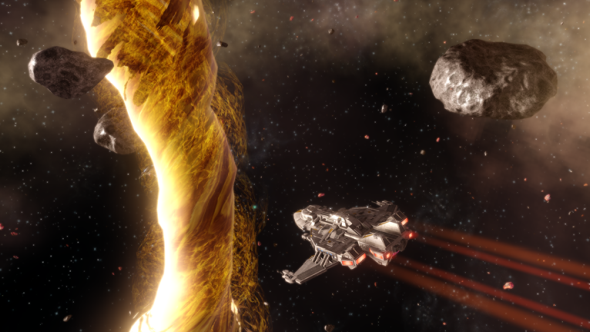 Upon entering Gamma Quadrant, you’ll complete missions to earn XP, as well as expertise (used to train bridge officers), Gamma marks (needed to fund projects in the game’s reputation system), and dilithium (endgame currency). You’ll be able to see where you can meet up with fellow captains to fight off the Hur’q, and receive notifications about attacks when they’re incoming. Then there’s the Swarm queue: a new five-player, co-op space queue where you’ll defend Dominion refugees from a ravenous Hur’q swarm. Again: what is their deal? That is seriously anti-social behaviour, even for an invader species. You’re nothing without your reputation and that’s doubly true in Star Trek Online. 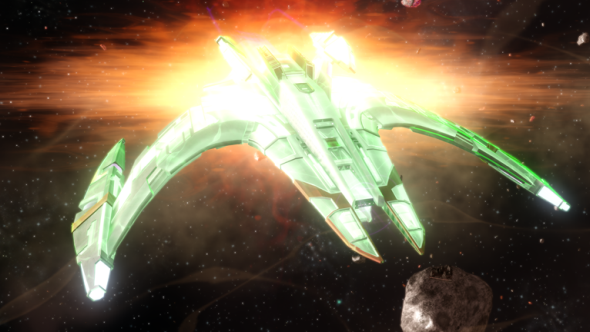 The personal reputation system lets you curry favour with the various factions floating around space, opening up potential rewards. Victory is Life adds the Gamma Task Force reputation, representing the coalition of groups that have come together to counteract the enemies pouring from the Gamma Quadrant. Up for grabs are new traits, kit modules, equipment sets, ground armour, and space visuals. The latter are the slots that override your ship’s default appearance, but really could describe the reason so many play Star Trek Online in its eighth year of existence. Space visuals: isn’t that all any of us are after? A view into life in deep space? Victory is Life is now, well, live. 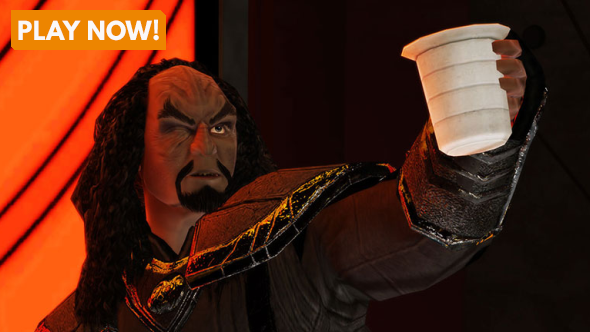 Visit the Star Trek Online site to sign up for free and discover deep space for yourself.